Describe the principles of transformers used in basic power supplies. • Primary and secondary voltages. Describe the principles of rectification used in basic power supplies. In a basic power supply the input power transformer has its primary winding connected to the mains (line) supply. A secondary winding, electro-magnetically coupled but electrically isolated from the primary is used to obtain an AC voltage of suitable amplitude, and after further processing by the PSU, to drive the electronics circuit it is to supply. The transformer stage must be able to supply the current needed. If too small a transformer is used, it is likely that the power supply's ability to maintain full output voltage at full output current will be impaired. With too small a transformer, the losses will increase dramatically as full load is placed on the transformer. As the transformer is likely to be the most costly item in the power supply unit, careful consideration must be given to balancing cost with likely current requirement. There may also be a need for safety devices such as thermal fuses to disconnect the transformer if overheating occurs, and electrical isolation between primary and secondary windings, for electrical safety. 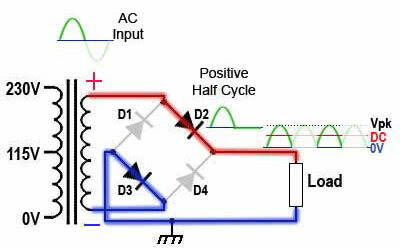 A single silicon rectifier diode may be used to obtain a DC voltage from the AC input as shown in Fig 1.1.2. This system is cheap but is only suitable for fairly non-demanding uses. The DC voltage produced by the single diode is less than with the other systems, limiting the efficiency of the power supply, and the amount of AC ripple left on the DC supply is generally greater. This figure is approximate, as the amplitude of the half cycles for which the diode conducts will also be reduced by about 0.6V due to the forward voltage drop (or Forward Junction Potential) of the silicon rectifier diode. This additional voltage drop may be insignificant when large voltages are rectified, but in low voltage power supplies where the AC from the secondary winding of the mains transformer may be only a few volts, this 0.6V drop across the diode junction may have to be compensated for, by having a slightly higher transformer secondary voltage. Half wave rectification is not very efficient at producing DC from a 50Hz or 60Hz AC input. In addition the gaps between the 50 or 60Hz diode output pulses make it more difficult to remove the AC ripple remaining after rectification. 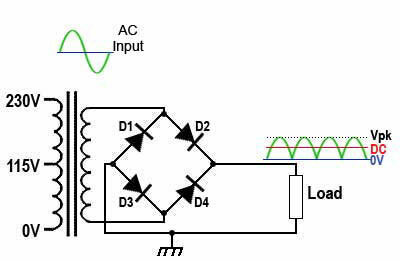 If a transformer with a centre tapped secondary winding is used, more efficient full wave rectification can be used. 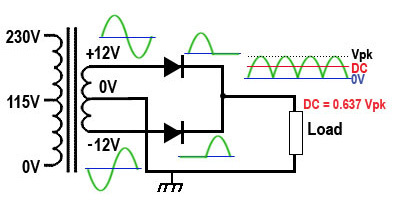 The centre-tapped secondary produces two anti-phase outputs, as shown in Fig 1.1.3. If each of these outputs is ‘half wave rectified’ by one of the two diodes, with each diode conducting on alternate half cycles, two pulses of current occur at every cycle, instead of once per cycle in half wave rectification. The output frequency of the full wave rectifier is therefore twice the input frequency. This effectively provides twice the output voltage of the half wave circuit, Vpk x 0.637 instead of Vpk x 0.318 as the ‘missing’ half cycle is now rectified, reducing the power wasted in the half wave circuit. The higher output frequency also makes the smoothing of any remaining AC ripple easier. Although this full wave design is more efficient than the half wave, it requires a centre tapped (and therefore more expensive) transformer. The full wave bridge rectifier uses four diodes arranged in a bridge circuit as shown in Fig. 1.1.4 to give full wave rectification without the need for a centre-tapped transformer. An additional advantage is that, as two diodes (effectively in series) are conducting at any one time, the diodes need only half the reverse breakdown voltage i.e the 'Maximum Working Peak Reverse Voltage (VRWM)' capability of diodes used for half and conventional full wave rectification. The bridge rectifier can be built from separate diodes or a combined bridge rectifier can be used. The current paths on positive and negative half cycles of the input wave are shown in Fig. 1.1.5 and Fig. 1.1.6. 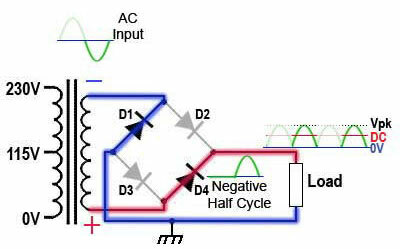 It can be seen that on each half cycle, opposite pairs of diodes conduct, but the current through the load remains in the same polarity for both half cycles.